Sour cream porridge is considered one of the most traditional Norwegian dishes, and it is for many families the obvious choice for Whitsun Eve, Midsummer’s Eve and “Olsok”*. The porridge is usually served with traditional cured meat or sausage called “grøtpinne” (literally; porridge stick). * Olsok (literally "Olaf’s Wake" or "Olaf’s Vigil" – that is the eve of St. Olaf’s Day) is now the Norwegian name for 29 July, traditionally the date of the death of King Olaf II Haraldsson of Norway in the Battle of Stiklestad, east of Nidaros (Trondheim), Norway, in 1030. Olaf was canonised by Bishop Grimkell in Nidaros on 3 August 1031, and is remembered as Rex perpetuus Norvegiae, the Eternal King of Norway. More so than his attempts to finally (and forcefully) convert the country to Christianity, Olaf’s martyrdom at Stiklestad appears to have contributed decisively to establishing the Church in all parts of the country. Until the Lutheran reformation in the Nordic countries in the 16th century, Olsok was a major church feast . 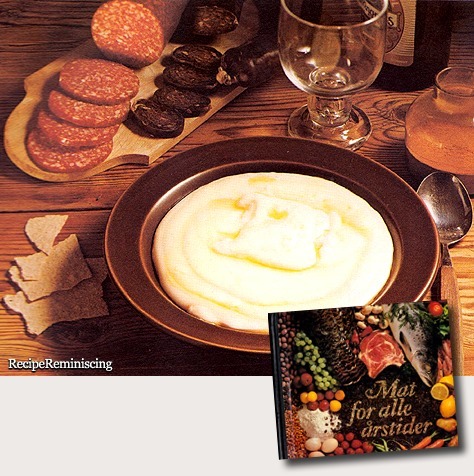 This entry was posted in Dinners, Party food, Porridge, Recipe collections, Recipes, Sour cream, Traditional recipes and tagged Festmat, Grøtoppskrifter, Rømmegrøt Med Grøtpinne, Sour Cream Porridge With Cured Meat or Sausage, Tradisjonell norsk mat, Tradisjonelle oppskrifter, Tradisjonsoppskrifter.